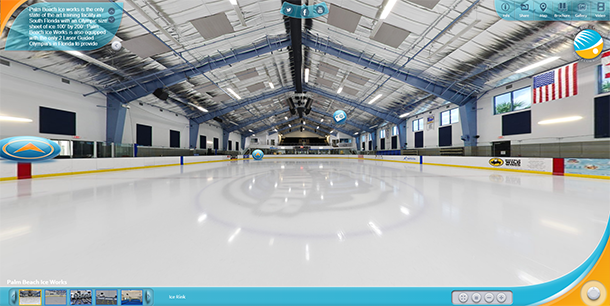 Click On Any Image Below For A 360 Degree Virtual Tour Of The Facility! 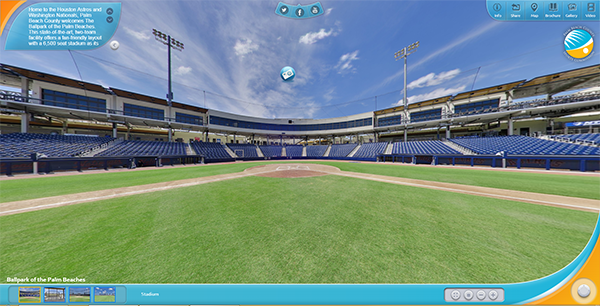 Home to the Houston Astros and Washington Nationals, Palm Beach County is thrilled to unveil FITTEAM Ballpark of the Palm Beaches. The state-of-the-art, two-team facility offers a fan-friendly layout with a 6,500 seat stadium as its centerpiece. Fans will find shade, a 360-degree concourse, suites and party areas in which to enjoy an all-encompassing Spring Training experience. The Astros and Nationals training areas each feature a six-field layout that is inviting and easily navigated by fans. This provides a total of 13 MLB diamonds on site. 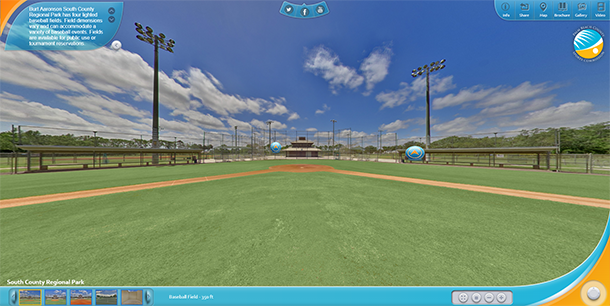 FITTEAM Ballpark of the Palm Beaches is conveniently located just off I-95 with ample parking. 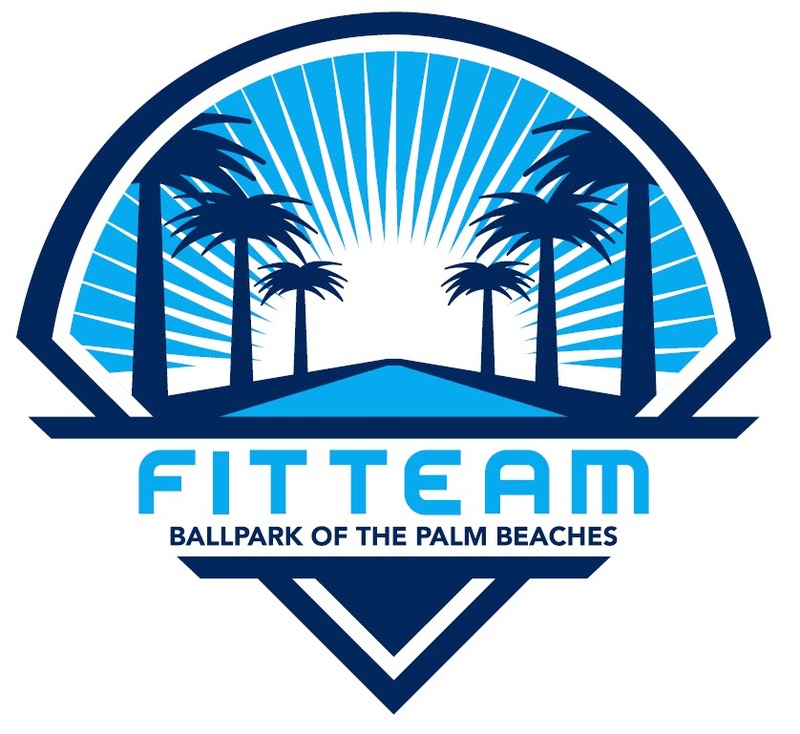 Beyond Spring Training, FITTEAM Ballpark of the Palm Beaches is the perfect destination for tournaments, corporate functions, concerts and festivals among other events. The 160-acre campus includes seven (7) multipurpose fields, a City Park featuring a large playground, splash park, four lighted basketball courts and a 1.8-mile walking trail. Seminole Palms Park in Royal Palm Beach is a beautiful, 70+ acre city park. It is full of palm trees, gorgeous athletic fields, and it even features a water park next door. 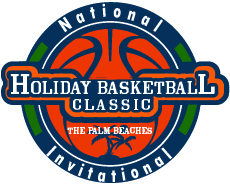 Both are managed by the Palm Beach County Parks and Recreation Department. There is something for everyone at this park, from the sports enthusiast to the water lover. There is such a wide variety of activity at Seminole Palms, from a Senior Softball League, to youth baseball, this park has it all. 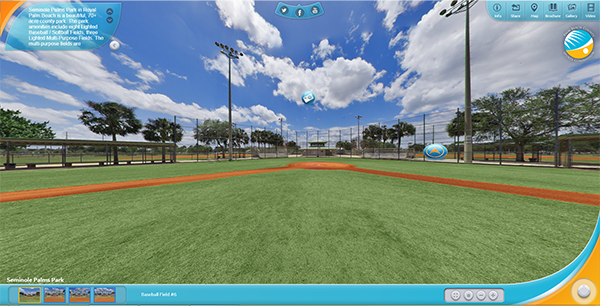 The park amenities include 8 Lighted Baseball/Softball Fields, 3 Lighted Multi-Purpose Fields (the multi-purpose fields are maintained and operated by the Village of Royal Palm Beach). They are reserved for approved youth and adult sports providers. There is 1 Non Lighted MultiPurpose Field Available as well as an uncovered picnic table area with grills. A picnic pavilion is available to rent for birthday parties or events. There are 3 different play grounds that are designed to be age appropriate. 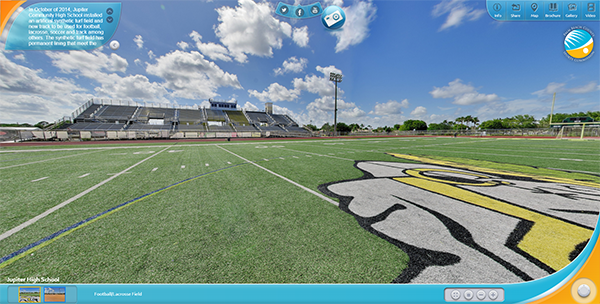 The Boca Raton High School athletic complex was built in July 2008. The stadium features FieldTurf, a type of artificial turf with a thin, blade-like carpet that will allow use no matter what the weather. The new turf is also twice as soft as the previous field, which is considered much safer. The stadium can host a variety of field sports including football, soccer, and lacrosse. The stadium features a nine-lane track, bleachers that stretch from goal line to goal line (for the home team fans) and from 10-yard line to 10-yard line (for visitors), with seating for up to 4,025 people. The stadium is accessible to the handicapped. It also has a pole vault and high jump, along with seven new lighted tennis courts. The Olympic-sized swimming pool was added and opened in early 2011. The pool is 50 meters by 25 yards. Water depth is 5’6” to 13’, and the deep well is 9’4” to 13’. The pool has excellent above pool lighting, heaters/chillers, locker rooms and a video room. 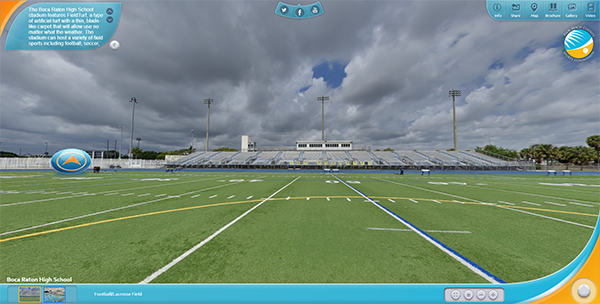 In October of 2014, Jupiter Community High School installed an artificial synthetic turf field to be used for football, lacrosse, soccer and track among others. The $910,000 synthetic turf field has permanent lining that meet the NFHS specifications for boys and girls lacrosse. The main stadium has a spectator seating capacity of 3,500. The main concourse also has restrooms and concessions avaialble. Locker room are within close proximity to the field and are located by the gymnasium. Permanent lighting structures are available for hosting night games. In October 2011, Florida Atlantic University (FAU) completed the construction of a state-of-the-art 30,000 seat stadium. This $70 million investment has an array of amenities that are not found in other stadiums in Division I programs. 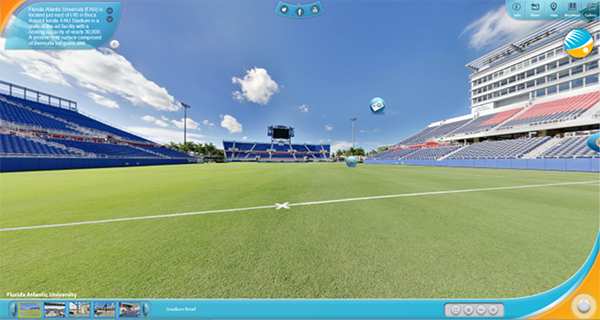 Located on the FAU campus in beautiful Boca Raton, FAU stadium features a tropical theme, which is appropriate for a South Florida destination. This is the only stadium in the United States that offers a view of the Atlantic Ocean for its guests. The stadium surface is Celebration Bermuda turf grass. Consisting of more than 144,000 sq. ft., the stadium offers plenty of press, meeting, and supplementary space required to host major events. The stadium is equipped with a press level, containing several press rooms, designed for radio and television broadcasting. The facility has two (2) suite levels consisting of 24 Luxury Suites, a 5,000 sq. ft. Delray Acura Club Level that includes a private lounge, and a 3,920 seat Delray Hyundai Deck Level within a covered 16,000 sq. ft. Tiki Bar area. The stadium is furnished with four (4) complete locker rooms for teams. The venue maintains 10 concession stands with 46 points of sales. FAU Stadium has removable goal posts, which makes this an ideal venue for any event. This world class facility is the must-see polo facility in the USA. The club hosts all of the top polo players in the world during the January-April season on its pristine surfaces in events, culminating in the US Open each April. With eight (8) polo fields operational, the club offers 60 acres of world-class field space that can host up to 50 soccer or field hockey-sized fields in one location outside of polo season. The Club has hosted numerous sporting events USA National Field Hockey Festival, AYSO National Games, and the International Weekend. 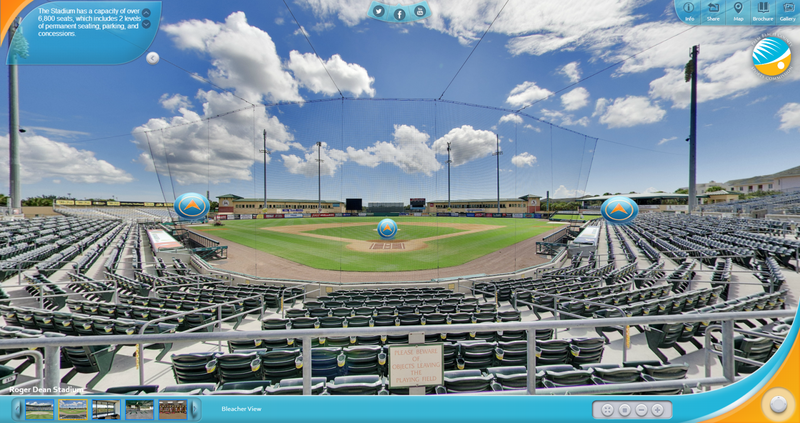 Roger Dean Stadium is a $28 million baseball complex that opened in 1998. The complex is the only baseball facility outside of Arizona that consists of one primary baseball diamond and 12 supplementary practice fields, with professional dimensions. The stadium features luxury sky-box seating, permanent seating, parking and concessions. The stadium’s capacity totals over 7,000 seats. Major annual events include MLB Spring Training, USA Baseball 16U Championships and the Perfect Game World Wood Bat Championships. The Delray Beach Tennis Center is a full-service public tennis facility with 14 clay courts, seven (7) hard courts, and an 8,200 seat stadium located in the heart of Delray Beach, FL just to the west of the world famous downtown area on Atlantic Avenue. 19 of the courts are lighted. The Delray Beach Tennis Center features an upstairs pavilion and conference room, pro shop with locker rooms, racquet stringing and merchandise. The club offers a wide variety of adult and junior programs, leagues, clinics and camps. 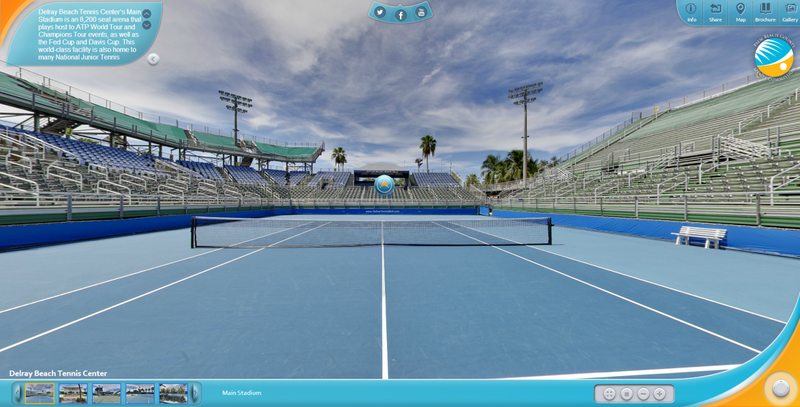 The Delray Beach Tennis Center has been home to the world’s most prestigious tennis events, including the Federation Cup and Davis Cup. 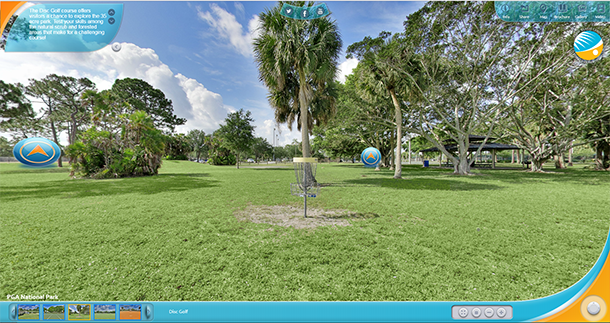 Okeeheelee Park, a 1702.1 acre park is one of the most prominent parks in Palm Beach County. This facility has (5) lighted baseball fields and (4) lighted multipurpose fields, (8) hard surface tennis courts, (1) grass volleyball court along with a 27-hole public golf course, a premier BMX track and waterskiing facilities. Okeeheelee Park is home to the Jim Brandon Equestrian Center, a 111-acre world-class equestrian showplace. The park is centrally located in Palm Beach County close to Interstate 95 and the Florida Turnpike and a short drive to Palm Beach International Airport. Palm Beach International Raceway is a 220 acre multitrack venue, which is an ideal place to host a motorsport event. In 2008, the facility received a complete makeover, and became the state-of-the-art facility that it is today. With the new updates in 2008, the road course now includes high level, high intensity, and low-glare lights on every track. The road course at Palm Beach International Raceway is 2.034 miles, includes 10-turns, and is 40 to 60 feet wide. 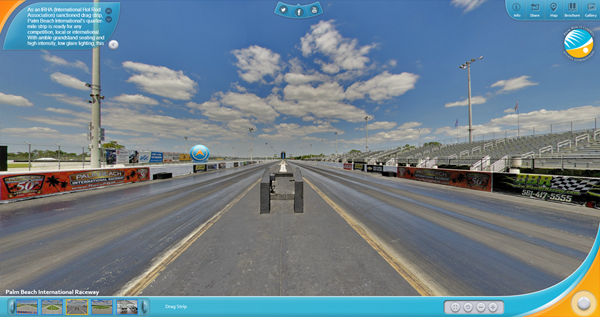 The one-fourth mile all concrete IHRA (International Hot Rod Association) sanctioned drag strip is a must see at the raceway. 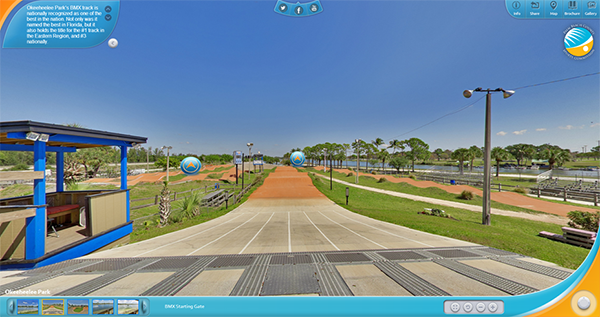 Also, included within the 220 acre multi-track venue is the Palm Beach Kart Center. The .8 mile, 11 turn track is great for the novice or expert driver. One of Palm Beach Gardens’ premier multi-purpose facilities, Gardens Park was constructed in 1999 as part of the Palm Beach Gardens Municipal Complex. Gardens Park is home to a total of 8 baseball fields, including 6 youth baseball fields, and 2 full sized adult fields. Gardens Park is also home to 9 lighted soccer fields that have space for bleacher seating and a concessions area. Village Park is the largest park located in Wellington, encompassing 114 acres. 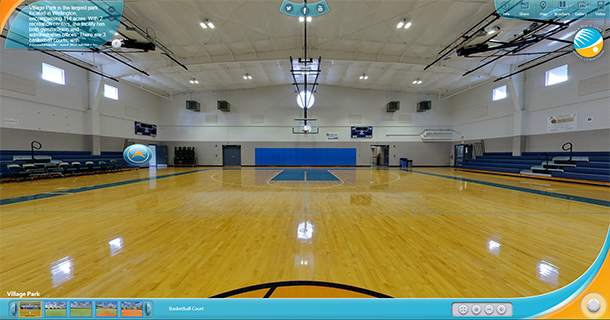 There are 3 indoor basketball courts, with scoreboards that can host volleyball games as well. The recreation centers also has multipurpose rooms, including a cheer room, and a wrestling room. Village Park has five full size, lighted soccer fields and six concession stand/ restroom buildings. The park has 4 full-sized football fields, 2 smaller fields that can be used as practice fields or for sports requiring smaller dimensions. 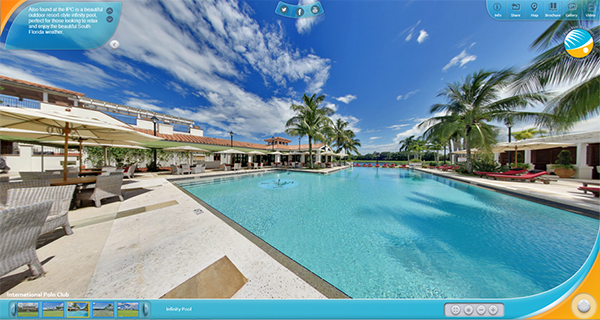 Mirasol Park is a hidden gem in North Palm Beach County. The Park is home to four basketball courts. Two with 8-foot hoops and two have full size 10 foot hoops. The courts are lighted for play at night, and can suit all levels of play. The park also has two lighted multi-purpose fields that can be lined for a variety of sports. Alongside the fields is a running trail. The multi-purpose fields are great for soccer, football, or even rugby. 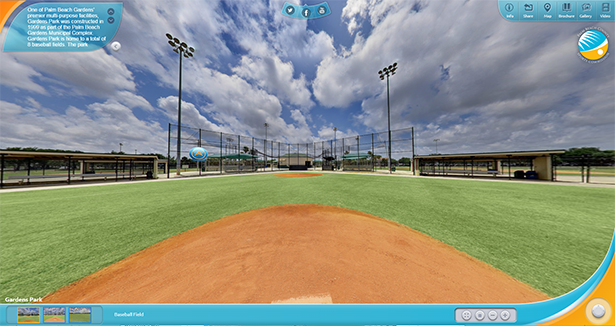 Mirasol Park is also home to a state-of-the art softball field with covered dugouts, bleachers, and backstops. The field is the perfect combination of mixed dirt to allow for great play, and quick recovery after rain. Located in beautiful Palm Beach Gardens, PGA National Park is a 35 acre park surrounded by water, and features a dock to fish from and a canoe launch. 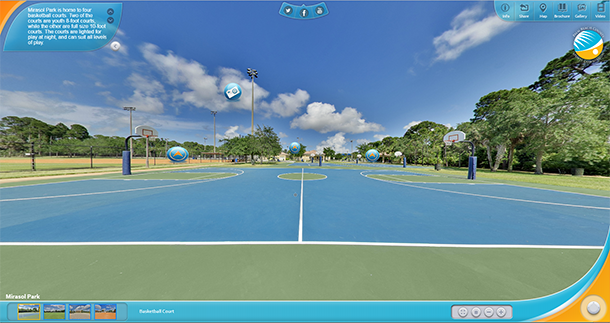 This park is home to two full-sized lighted outdoor basketball courts and one youth size court. The lighted courts have a sport court, non-slip surface. The park features three lighted multi-purpose fields, great for tackle or flag football, lacrosse, or soccer and features a large bleacher seating area, along with well-maintained, pitched fields for water run-off. Burt Aaronson South County Regional Park includes almost 900 acres of recreation. This park is part of Palm Beach County’s award-winning park and recreation system and one of the most comprehensive leisure destinations in the State! 27-hole Golf Course, Amphitheater and a special event area, Fishing and Boating center, Boat Ramps, Fishing Piers, Ski Lakes, Picnic facilities, Playgrounds, Bike paths, Cross-country course, Restrooms, Tennis courts (19); Racquetball courts (12), Water Ski School and training center, Baseball and softball fields (8+), Basketball courts, Multi-Purpose Fields (5-120yds x 70yds), Volleyball courts sand (2), Volleyball courts paved (4), and Bicycle Path (2 miles). HOURS: Sunrise - Sunset, lighted court facilities open until 9:00 pm, lighted athletic fields (permit required) open until 10:00 pm, facility hours vary according to season. The National Croquet Center is the largest and finest dedicated croquet center in the world. It resides on ten beautiful acres in West Palm Beach just minutes away from Palm Beach International Airport. 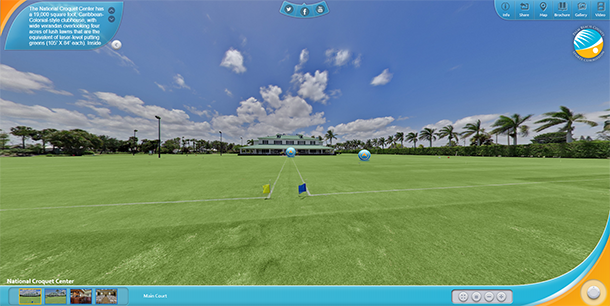 The National Croquet Center has a 19,000 square foot, Caribbean-Colonial-style clubhouse, with wide verandas overlooking four acres of lush lawns that are the equivalent of laser-level putting greens (105’ X 84’ each). Inside you will find wide entryways; gracious space for dining; an elegant lounge; and two ballrooms upstairs for dinners, dancing, or meetings, or a combination thereof. These qualities make it an ideal party space for groups hosting 20 to 600 guests. The nineteen full-sized lawns can accommodate hundreds of players at any one time. When you host your event at the National Croquet Center you are not only choosing a unique venue you are also choosing to work with some of the most qualified event planners in Palm Beach County. Palm Beach Ice Works is the only state of the art training facility in South Florida with an Olympic size sheet of ice 100’ by 200’. Palm Beach Ice Works is also equipped with the only 2 Laser Guided Olympia’s in Florida to provide clients with the best sheet of ice possible. Other amenities include; locker rooms, NHL size player’s benches, and strength and conditioning rooms. Palm Beach Ice Works is home to a fully equipped fitness facility, featuring state of the art cardio, weight and Pilate’s equipment. The perfect place to enhance your skating skills with off-ice cross training. Palm Beach Ice Works provides ample freestyle sessions, off-ice conditioning, power-stroking classes, as well as a competitive and test track ice-dancing program. 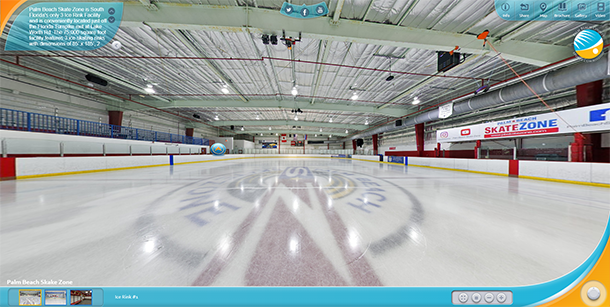 Skate Zone’s ice hockey program is the largest in Palm Beach County and home to the Palm Beach Hawks, the only Mite to Junior level program in southeast Florida. Classes and leagues are available for ages 3 to over 50 and all skill levels. Palm Beach Skate Zone’s mission is to deliver the best skating and hockey experience for you and your family. More Palm Beach County Facilities Coming Soon!